While this may look like some kind of crazy, action hero version of the Hanukkah story, don’t judge a book by it’s cover. 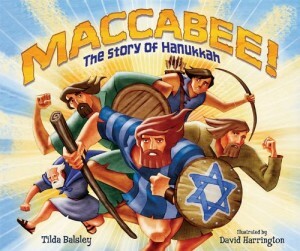 Tilda Balsley does an amazing job of distilling the Hanukkah story for the 3 to 6 set. With rhyming text, we learn the story behind the Festival of Lights. Antiochus, Mattathias and his five sons, and the re-dedication of the temple are all part of the story. Though it does get a little hokey in places, this is the first story that I’ve seen that gives a good background to why Hanukkah is celebrated and the history behind it. Balsley’s approach and Harrington’s illustrations are less lesson or lecture style and much more storytelling. Andrew Clement’s first novel is an excellent tale of the power of words. Nick Allen is entering fifth grade, where he will face Mrs. Granger, the language arts teacher who has a no-nonsense reputation and a love of the dictionary. On the first day of class, Nick gets an extra assignment from “The Lone Granger” on the history of the dictionary. Learning that it is people who define words, Nick comes up with a plan for creating a new word for a pen: Frindle. Soon Nick has all his friends using the word, much to the dismay of Mrs. Granger. She believes that children should “learn to use the words that we already have.” As the new word takes on a life of its own in the face of attempts to squash its use, Nick learns much more than he bargained for in this war of words. Frindle is an excellent story for those looking for chapter books that are a level up from beginning chapter readers. The message is a positive one for both Nick and Mrs. Granger. Plus, the descriptions that Andrew Clements gives about grammar school life are priceless; especially those of the “villain” of the story, Mrs. Granger.